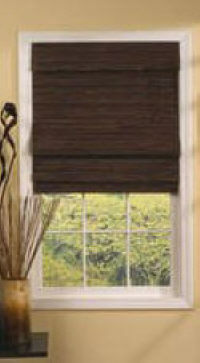 Wood blinds are a very effective and attractive form of window shade and sun control. Outdoor shade screens and indoor blinds will do wonders for your utility bill. 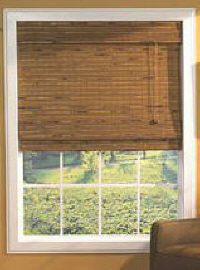 Below are a few ideas for improving your sun control by installing blinds. The beauty of Tahiti has inspired people for years. If you want a piece in your home that is Tahitian inspired, but you can't afford a Gauguin - the "Tahiti" Roman shade is for you. This shade is constructed of high quality, hand selected bamboo and wood. With most window coverings, you have to sacrifice style for functionality, but these Roman style shades give you both fashion and function. Whether you are looking for an enchantingly textured and decorative window shade, or a shade that will give you privacy and energy efficient insulation, this is the shade for you. A built-in top valance completes the look of this shade. These are a wonderful alternative to traditional white plastic Venetian style blinds. This shade is easily installed in minutes and all necessary hardware is included. They are perfect for living rooms, bedrooms, bathrooms, or any room where you want privacy, while still letting a touch of sunlight through. You will practically feel cool ocean breezes, and be inspired to shake up a batch of mojitos when you look at this pecan colored "Havana" Roman Shade. This shade is constructed of high quality, hand selected bamboo and wood.